Don't be afraid to use decorative items in smaller spaces. 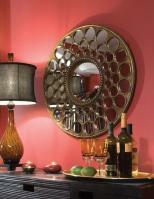 When done in moderation, a large glamorous mirror or striking accent pieces can make a small space feel special. For more great ideas visit www.cheapchicdecor.com.